This week has been a great success with our Presence for Non-Profits series. You’ll see much of it summarized here, along with details on how you can win a brand new Kindle Fire. Enjoy! Do: read this post, because it’s great. Don’t: not read this post (because it’s great and I love double negatives). Discover the Dos and Don’ts of Business Apology Email Marketing. All week long we’ve been running our new series, Presence for Non-Profits. Any and all RTs of the series will count as an entry into our Kindle Fire giveaway. You must be following @BenchmarkEmail on Twitter to be eligible to win. The contest will run from September 21st through Monday, October 1st at 9:00 AM PST. 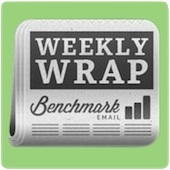 Be sure to ReTweet Benchmark Email’s Non-Profit Series & Win a Kindle Fire. Giggity giggity goo! It’s The First Amendment Quagmire of Online Videos. "Blog" might still be a word that elicits confusion from my parent’s generation, but it's also where some of the most reading is done online. They can inform and entertain in a more informal, engaging way. Find out How to Use Blogs to Engage Your Non-Profit’s Contact Base. Asking for money isn’t easy, unless your name is Bernie Madoff or you’re my old roommate making a desperate plea to his parents at the end of every month for rent money. Lucky for you, here are 3 Elements of Successful Annual Appeals. It goes beyond the man or woman waving a bell outside the grocery store. Learn about Taking Non-Profit Fundraising Beyond Special Events & Campaigns. Many people hear the phrase non-profit and assume no money. While that’s not always the case, it’s good to know there are a good amount of free and easy-to-use tools at your disposal. Find out How to Use Social media Tools to Help Your Non-Profit. Lots of people asked this question for the Ask Andy edition of the Benchmark 5 this week. We’ve invited a crack team of lawyers to tell you How to Start a Non-Profit. You know how much I love presents? This afternoon I received a package at work, which I thought to be a belated birthday present. I was then disappointed when it turned out to be the Kindle Fire I ordered for the giveaway. You can use these 3 Ways to Turn Your Non-Profit’s Presence into Presents. Truth be told, this blog post required the most writing and research I’ve done since high school. I’ve asked to return to my regularly scheduled dad jokes and obscure pop culture references, please. That being said, I’m very proud of this extra informative Benchmark 5: Answers to Your Non-Profit Questions.